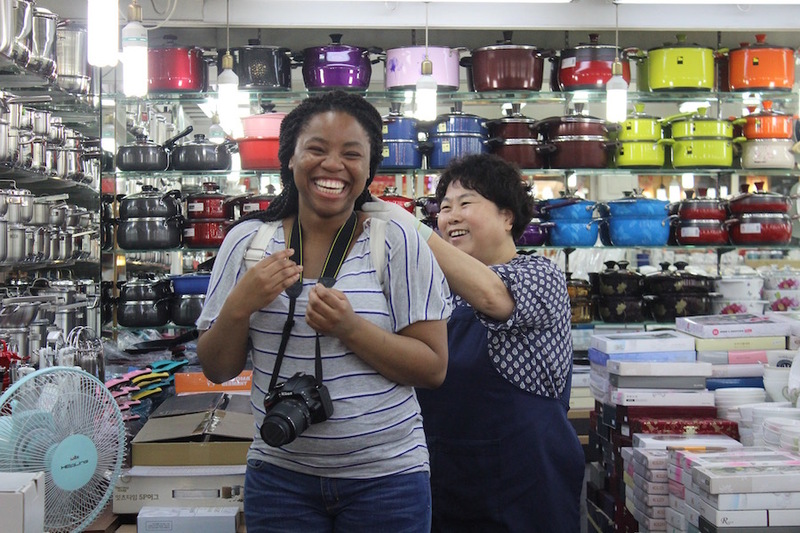 A Korean woman touches the braids of Chereese Cross, a Journalism Without Walls student in the middle of Gwangjang Market. Many Koreans have never seen this kind of hair before in person. Photo by Taylor Ha. The color of my skin did not startle the Koreans; my braided hair did. I learned this by my third day in Seoul while riding the subway. An elderly lady walked into the train with her eyes glued to me. I smiled and kept a calm face, assuming this was her first encounter with a black American . But then she started speaking to me. Of course, I couldn’t understand her. I don’t speak a word of Korean. Still, I continued smiling. Then the woman started making gestures towards her head, but I was still clueless. So I turned my own head away. Then, all of a sudden, I felt a slight tug on my braids. I turned around to see the woman studying my hair up close. I don’t know if she was more intrigued by my almost waist- length braids or the unique twists of it. Either way she was very curious. Living in New York, I’ve never had a complete stranger come up to me and touch my hair so I was dumbstruck and unsure of how to react. Then, just as quickly as the woman had come, she walked away. Later that same week, again on the subway, another stranger was drawn to my hair. This time it was an elderly man. He entered the train and smiled at me. But he too was interested in something more than my smile in return. Once again, when I turned to look away, I felt the same slight pulling on my hair. Like the woman from my previous encounter, he was touching my braid strands. By the look on his face I could tell he was very fascinated with them. As black person traveling to South Korea for the first time, I had no idea how they would react to my skin color. Nevertheless, I didn’t let that deter me from making this trip. Yes, I received a few uncomfortable stares here and there, but to my surprise the focus wasn’t on my skin but on my hair. As unexpected as these stares were, I was not at all offended or upset by them. By the look on people’s faces, I could tell that they were just simply curious about something they had never seen before. After these first two encounters, I accepted that these probably weren’t going to be the last of last them – and I was right. They prepared me for what to expect for the next two weeks. I remember one day I was just casually roaming a bookstore when a mother came up to me. She told me her two young children, who looked about 5 years old and were shyly standing in the corner, wanted to know where I was from because they really liked my hair. I told her I was from America while looking over at them with a smile. As I travelled around Seoul, people either touched my hair, gave me a compliment or just a curious stare. Seoul was new to me but my hair was new to Seoul.